Eyes Set To Kill singer and guitarist Alexia Rodriguez (center) is wearing a cut-up Junk Food “Where The Wild Things Are” t-shirt with a pair of gray acid washed jeans. Her sister Anissa Rodriguez (right), ESTK’s bassist, is wearing a tank top and jeans from Peter Says Denim – a small Indnosesia-based line that sponsors the band. 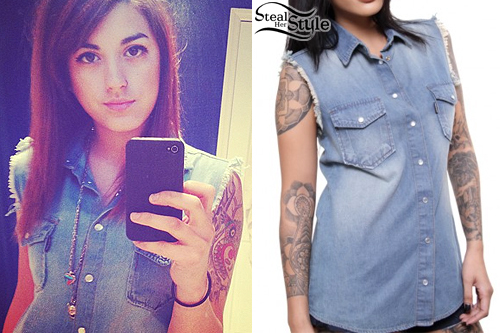 Her top is the Monalisa tank ($25.12) and her jeans are the Cougar skinny jeans ($62.02).